I believe in the church of Meryl. After her successful introduction to Meryl's greatness several months ago with Sophie's Choice, our friend Annie agreed to come over last night for dinner, board games, wine, whiskey and Doubt. It was the perfect night to stay in and watch this film. Doubt has always reminded me of fall and with the rather sharp drop in Minnesota temperatures this week, we were able to enjoy a cozy fire during the movie. Similarly to when we watched Sophie, Annie commented on how perfect Meryl's Bronx accent was during the film. What was also fun to watch was how Annie sort of updated Joe and me about what she thought was happening with each character, how she was forming opinions about them and whether or not Father Flynn "did it." I think writer/director John Patrick Shanley, along with the excellent acting by the four main characters, accomplished that uneasy feeling of ambiguity they want us come away with. The three of us had a conversation after the movie, discussing plot details, the brilliance of the acting and screenplay, and the setting around which everything takes place. It was fun talking about the dynamics of the Catholic church in the 1960's, the limited career opportunities for women in that era, and the plight of powerless minorities in a very different America. In particular I found a new appreciation for just how fantastic Viola Davis is in her role as Mrs. Miller. I love this movie and story and would've loved to see it on stage. I'll settle for the world premiere of Doubt at the Minnesota Opera in January. Super jazzed to see Denyce Graves for the first time in the role of Mrs. Miller. John Patrick Shanley is the librettist and we all know how much a certain someone enjoys opera. Might I have a run-in...? I really don't care about theses awards, but a fine blogger I'd be if I didn't at least mention this. Most notably Meryl's up for "Favorite Dramatic Actress" and "Favorite Movie Icon." What's strange is that the icon nominees are all women. Of course anyone can be written in, but apparently the People's Choice folks don't think men are particularly iconic. I can't imagine Meryl doesn't stand a pretty good chance at winning the icon award. For crying out loud, one of the names listed on the site is Blythe Danner. What? I don't even know if Meryl would show up for these awards, but the show should be televised in early January. Vote here! It's been a slow week for Meryl in Oscar buzz for Hope Springs and filming updates on August: Osage County so I thought I'd tackle my next Academy Awards analysis. In 1988 Meryl portrayed Lindy Chamberlain in A Cry in the Dark, a film about Australian Lindy Chamberlain and her daughter's snatching and ultimate death by a dingo. I won't get too into the details of the real case that was going on during the filming of this movie (I'll save that for a film review and likely a "snub"). Suffice it to say, this was a rather contentious undertaking, as Streep was obviously an American in Australia portraying a very infamous woman. Jodie Foster came away with the first of her two Oscars. She would take her second only three years later for The Silence of the Lambs, which is possibly my all-time favorite film. Glenn Close had a pretty damn good decade herself, with five total nominations (three in supporting). No wins for her, however. I can't believe I've never seen Dangerous Liaisons; it's the only one of the five performances listed above I haven't seen. Sigourney Weaver was a double nominee that year (supporting in Working Girl). She and Close were probably gnashing their teeth at this 26 year-old taking the prize after the dues they had paid. Griffith was great, but in my opinion likely 5th place that year. Of Meryl's five losses for Oscar in the 1980's, this and The French Lieutenant's Woman were two performances that arguably were the best of their respective year. I'll go over this in a future snub post eventually, but considering the frequency with which Meryl had been recently nominated, fatigue was likely setting in. It also would've been her third award in nine years. Yeah, wasn't gonna happen. 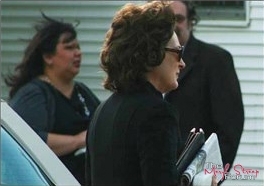 More pics from set of "August: Osage County"
I feel like kind of a bad Meryl fan/blogger. 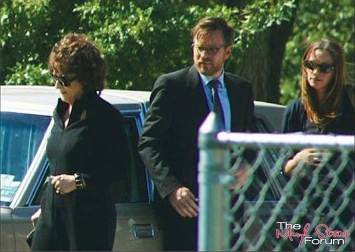 Evidently there have been two additional snapshots of Meryl from the set of August: Osage County that were posted online like a week ago that I've only come across now. I was out of town last night, so after getting back home this evening I wanted to post about the new pics of Ewan McGregor, Dermot Mulroney and Abigail Breslin that were released a couple days ago. You can see those here. What I was surprised to find were these two rogue pics of Meryl. As you can see, the photos come from the Meryl Streep forum gallery. I was a bit confused at first because I thought it was a completely different site, but turns out the gallery kind of has its own separate page. Does anyone else see a likeness to Meryl's other Oklahoman film character Karen Silkwood in these pics? I wonder if Meryl had any input on the styling. These are clearly from the same scene as the only other photo we had up to this point...Beverly's funeral. I understand the new pics of McGregor, Mulroney and Breslin are also from the same scene. Apparently the three of them take Steve's (Mulroney) car to pick up some wine for the family dinner after the service. We can see the Florida license plates, as in the script, Karen and Steve live in Florida. The red sports car fits Steve's character pretty well...sort of midlife crisis, smarmy, douche baggy. I read on the Meryl forum that she's not due on location this week. I believe they'll be shooting the remainder of the scenes at the Boulanger home in Pawhuska. The pics might be a little harder to come by if everything is being shot indoors. Stay tuned, and unlike me...have patience. On this blog I've historically been more inclined to post updates regarding Meryl's filming schedule, awards buzz, project rumors and past successes. I tend to pass on much of the humanitarian work she does. Not that it's not incredibly admirable stuff, it's just that the impetus for my thoughts on her lean toward what I see onscreen. But part of my enjoyment of her lies in the fact that she demonstrates such a fantastic social awareness. No doubt it's part of what can make one a good actor. Seeing people, trying to understand what it would be like to be someone else. I can remember Joe (who btw returns from a two week trip in Morocco tomorrow!) once telling me that this is what being liberal is. I don't presume to know the ins and outs of Meryl's political views, but I think it's safe to say that she's a very progressive-thinking woman. With a major election just four weeks away, Meryl has filmed a PSA for The Center for Reproductive Rights. As a progressive liberal myself, I think it's a good message to pass along. So head to the website and sign the bill. Oh, and if you're in Minnesota, vote "No" and "No." 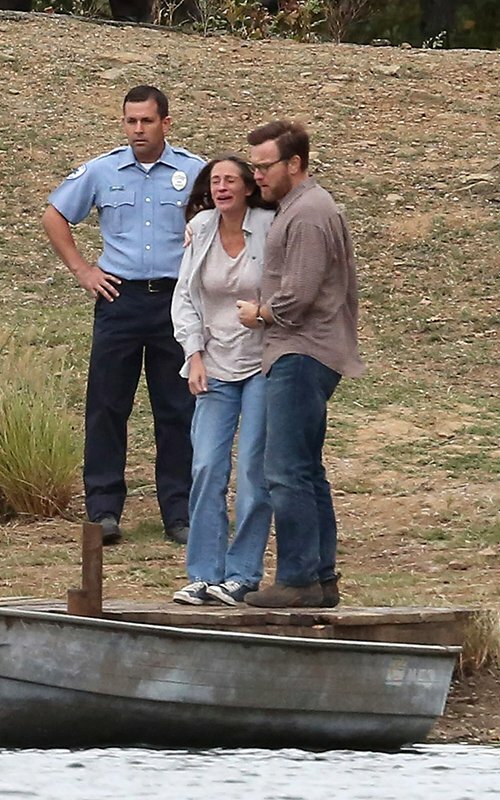 New pic from set of "August: Osage County"
Is this Sheriff Deon Gilbeau with a sobbing Julia Roberts and her onscreen husband Ewan McGregor? The character may just be a policeman but this is undoubtedly where Barbara is brought to identify the body of her dead father, Beverly. I found this pic on Awards Daily forums but I'm not sure who the actor is alongside Roberts and McGregor. Sheriff Deon is the only character with lines in the play who we've yet to get confirmation on casting. Newell Alexander has been cast as "Dr. Burke" according to imdb, and although mentioned in the play at the beginning of Act III, he does not appear on stage and has no lines. CanNOT wait for more stills that include Meryl! Meryl more likely for "Into the Woods"? This morning on The Meryl Streep forum, Regina at FYC Meryl Streep posted a notice of an Into the Woods film cast reading that evidently took place yesterday. Donna Murphy was listed as The Witch, so I thought this was to be taken as confirmation that Meryl would not be participating in the project. However, there is an article on Broadway World that indicates Meryl is expected to be in the film cast, but was unable to attend the reading (makes sense since she's in Oklahoma shooting August: Osage County). This article ultimately means two things to me: 1) the film is definitely happening, and 2) the cast has yet to be solidified, and Meryl is still "in talks" for the role. I expect we'll get a little more info on this over the next week, but I doubt any of it will confirm or deny Meryl's absolute participation. I'm just glad to learn she's still attached to the movie. Joe will be so pleased.